Today, January 30, the Declaration on ethics and integrity in university teaching, was presented. 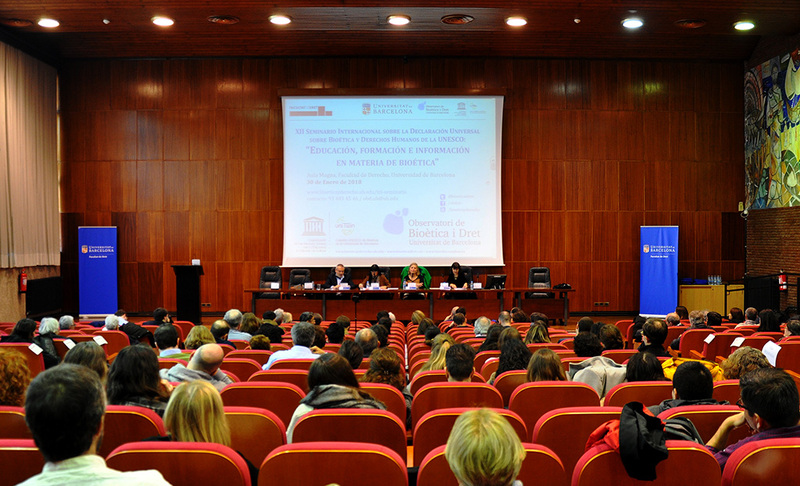 It was created and coordinated by María Casado, director of the Observatory on Bioetics and Law (OBD) – UNESCO Chair on Bioethics of the UB, together with Miquel Martínez, professor of Theory of Education and member of the Research Group on Moral Education (GREM) of the UB, and Maria do Céu Patrão Neves, professor of Philosophy, discipline on ethics and lecturer of Bioethics at the University of the Azores. The presentation took place within the framework of the 12st International Seminar on the UNESCO Universal Declaration on Bioethics and Human Rights: “Education, training and information on bioethics”, organized by the OBD. The vice-rector for Teaching and Academic Planning of the UB, Amelia Diaz, opened the session, together with Maria Casado and other coordinators of the Declaration. The Declaration on ethics and integrity in university teaching bears two conclusions in which some aspects stand out, for instance, revaluing the academic freedom, assessing the funding mechanisms of universities and promoting the culture of effort, scientific rigour, intellectual curiosity and participation in the academic life and society. Moreover, the report points out that there is a need to identify and counter educational malpractices such as plagiarism, and to promote a culture of accountability and the evaluation of the teaching and research activity. Regarding academic freedom, the text specifies that teaching should have a pluralist focus and non-indoctrinating, it should encourage the critical spirit and recognize the importance of rigour and objectivity. Other recommendations are the need to get students involved in the learning process, promoting open-access publications, create rankings avoiding cultural bias or to make evaluation criteria public, transparent, and objective. The report analyses several dimensions of the teaching integrity in university teaching: relation between lecturers and students, relation between colleagues and among different members of the university community, and the role of the lecturers towards the university institution and society. Some of its ideas state that there is a need for a teaching staff that takes the students not as people in search for a degree but “as a single person under a developing process”, and that there is a need to act as a model regarding the lecturers, in particular at this moment when lecturers are not only present in the classrooms but also in social networks. The Declaration highlights revaluing the academic freedom, assessing the funding mechanisms of universities and promoting the culture of effort, scientific rigour, intellectual curiosity and participation in the academic life and society. Regarding the treatment of academic content, it points out that it has to be done with a “delicacy and ethical refinement”. With new educational scenarios –such as online environment, organizations to carry out practices or service-learning-, the authors of the text calculate the lecturer has to carry out a task accompanying the student and has to be careful so that this does not involve a reduction of the academic rigour. Regarding the relationship between the lecturer and society, the document highlights that “the university lecturer and the university as a whole can and have to be a model, an observer of everything that occurs and an analyst who provides a rational reasoning”. All these premises result from a previous analysis of the document on the current status of higher education institutions, which have experimented –over the last decades- “deep alterations determined by the evolution of society”. The authors note there has been a reduction in university public funding and that there is a commercialization of teaching and an atrophy in humanistic education. They also point out the problem of ageing among lecturers due a lack of recruitment and criticize a “quantifying obsession that enables a reduction of activities”, so that the mission of social service in teachers and higher education institutions is altered. The Declaration on ethics and integrity on university teaching is the second document of a trilogy that started out with a text, already published, on scientific integrity, and which will follow with a document on the management of higher education.